and parks with O for Odd names! 'Oh my!!' looks like you are about embark on a beautiful and interesting journey. So many different natural offerings plus a wine tasting opportunity! I'm sure you'll be Writing Positive Letters Inspirational Stories. Thank you for reading and commenting on my Guest Post (Alex’s site). It’s good to meet you! What a great group of 'O' places for you to look forward to visiting. The Osoyoos Indian Band would be a favorite of mine. I'll look forward to your photos and report on that trip. Sounds like you will be in Canada for quite some time to come...October! You enjoy your 'O' holiday Hilary. Sounds gorgeous! O dear I don't know much about these places at all. I envy you your trips and look forward to reading about them after they have taken place. Canada has such beautiful and varied country right across it's enormous length. looks like a really cool place to visit. glad you're going to visit in September and have a little wine and enjoy the beautiful vistas. i'd like to visit and do lot of stuff...swim, hike, bike. then i want to visit the ghost towns and go mine for some silver. i'd like to talk to the Osoyoos indians and learn about their culture. then a steamboat ride. wow...that would sure be a great holiday. Silver mining, ghost towns and steam boats... My type of historical region! Have fun. Which I know you will. We spent a couple of nights in the Okanagan Valley on my first visit to Canada in the early 90s. It was an unusually hot summer and I remember wilting in the 40C heat. All that and wine too! Sounds just perfect! Thanks for taking us there Hilary! Hi Hilary. A desert in Canada? good grief, I didn't know American desert stretched so far north. Wish I were joining you on the wine tasting and foodie tour in September. Another lovely post Hilary. Beautiful area. I see why people flock to it. Enjoy your wine tasting! For me, the great outdoors will do! ;-) It does looks like a wonderful place to hike. The term “Indian Band” has a kind of pejorative connotation doesn’t it? But that is still the name of the First Nations people of that area and the one that they use. Enjoy your time in one of the most beautiful parts of the province. I've seen more of BC than any other province, but clearly, I have not seen enough of it. @ Keith - oh yes ... and wine too - can't do much better can I! Yup and you're all coming with me!! Who knew Canada had a desert! It must be the literal definition rather than the subjective one. Still, I'll be googling that. That should be a great trip. I bet you're looking forward to it. Looks like a really pretty area. Sounds like a wonderful and beautiful adventure awaits you later this year! Wrinkly Face has to be worth a visit - if only to wrinkle your own face with laughter. Oh wow! 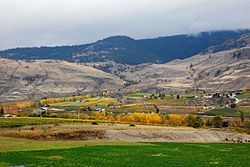 My cousin lives in Okanagan on the Washington side. What a beautiful place to have an adventure! The pictures remind me a little bit of the Colorado Rockies. Okanagan looks lovely... and really, how bad can anyplace be that's called Peachland? That area looks beautiful, Hilary. I look forward to your impressions after your September visit. Roll on September! Land of opportunity for sure! And for observation - thanks Hilary, great post! 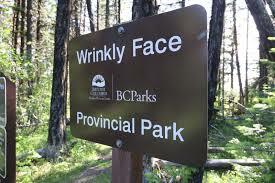 Wrinkly Face Provincial Park??? That's funny! I love odd names for towns and places. Those are some beautiful places! And funny names . . . I'm not sure if I'd want to have my picture taken near the "Wrinkly Face" sign. British Columbia is beautiful and your photos do it justice. I did not know that the desert so prevalent in the US southwest had its start up in Canada. @ Rhonda - thanks ... what I can see and what I know shows me BC is beautiful ... I hope I get to see rather a lot of it - not sure about that though. I hadn't realised the desert started up here either - that was an interesting bit of geography.